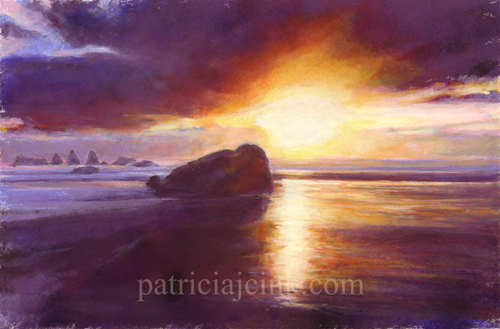 This is the fifth in the Bandon Sunset series with rock formations. I rarely discuss composition, but this painting breaks the rules and works nicely anyway. My reference photo had the sun and the big rock close to center which is usually a big no-no.Then the dark incoming ocean wave slices the painting in the middle horizontally, another no-no. But the play of the sunlight and dark clouds make the composition work by bringing the focus to the distant Face Rock Kit Rocks, back lighting them and making them the center of attention.